Like many others, you are probably searching for some kind of balance in your life. If so, the Enneagram of Personality is a great tool to help you find peace of mind, body, and spirit. The theory and belief behind the Enneagram system suggests that soon after you are born, you are oriented toward one of nine distinct personality types, the traits of which determine the way in which you navigate and survive in the world. As an adult, a lack of awareness of the limitations inherent to your type — those that determine your greatest personal strengths and weaknesses — can cause all sorts of difficulty in your life. RELATED: What You're Like In A Relationship (And Exactly How You Need To Be Loved), Based On Your Enneagram Personality Type. The good news is that you are more than your primary Enneagram type. We all have aspects of each of the nine types within us. But learning more about the characteristics of your primary type according to the Riso-Hudson Enneagram Type Indicator (RHETI®) test can help you gain self-awareness regarding the patterns you often act out unconsciously. On the Enneagram map, there is constant movement among nine levels of development, as each of us goes up and down in health. 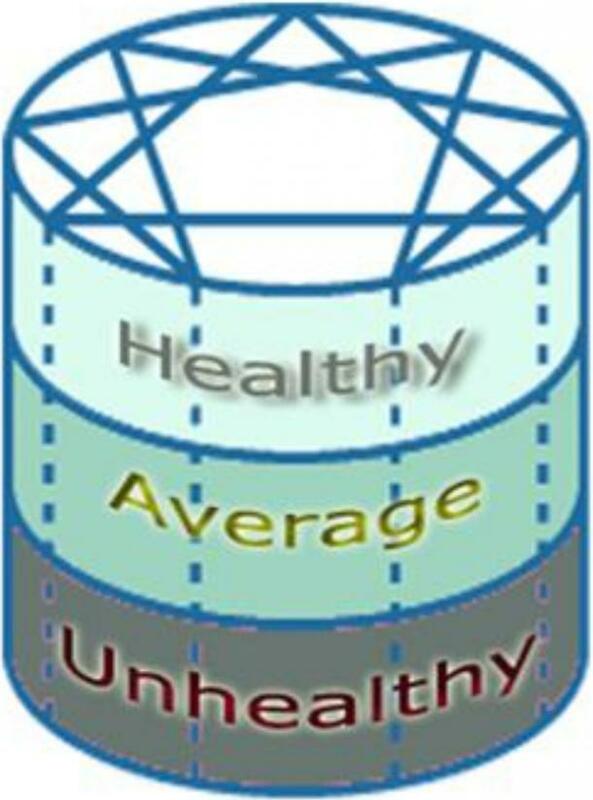 Most of us seeking growth in our lives fall within the healthy to average levels. Within the Enneagram map, there are also directions of integration and stress. When you are feeling overwhelmed at a lower level of health, it can be helpful to explore the paths of stress and integration for your type to uncover clues about what you need to do in order to restore balance. As you become more aware of your automatic responses to life's challenges, you develop the ability to notice when you're on the verge of moving into an old pattern. Of course, learning new habits takes time. At first, you will notice your behavior only after you've followed the same old pattern. Then, you will come to the point when you see the pattern as you are participating in it. And eventually, you will be able to stop the habit and act in a new way before the pattern begins. Once you discover your Enneagram personality type, you can look at the Enneagram map for guidance in achieving and maintaining balance. But first, you must determine which of your behaviors are holding you back so you can know what it is you want to change. To help you find balance, here are the greatest weaknesses inherent in the traits of each Enneagram personality type, as well as the strengths you can emulate of others. As a type 1, you know the world can be a better place. You know, within you, what needs to be done to bring out the goodness in the world. Your greatest personal weakness is that, when you realize your efforts aren't enough to keep the world good, you get more and more stressed. Not only are you hard on yourself, but you are hard on those you love. If you are a Type 1 and want to reclaim your balance, try emulating the healthy qualities of a Type 7. As you, get more in touch with your true self, you will bring out your best Type 1 qualities. They include wisdom, bringing out the best in others, being aware of the mysteries of life, hopeful, ethical, responsible and caring. Signs you are getting healthier include the voice of your inner critic quieting down and you begin to hear the quiet, gentle voice of your true self. As a Type 2, you have a natural inclination to know what others need. You have an insatiable urge to help the people in your life. This sense of service comes out of the beautiful love you have for yourself and those around you. Your greatest personal weakness is that, when something traumatic happens to you, you begin to wonder if you are lovable. As you fear this, more and more focus goes into doing good for the people you care about, often at a high cost to you. If you are a Type 2 and want to reclaim your balance, it would be wise for you to emulate the healthy personality traits of a Type 4. As you get more in touch with your true self, you will bring out the best of the Type 2 qualities. These qualities include being loving of self and others, caring, adaptable, insightful, and aware of how others feel. Signs you are getting more balanced include learning to care for yourself as well as putting your own needs high on the list. Finally, you can help others without any expectation. As a Type 3, you are inclined to be a mover and shaker in the world. You have tremendous energy and are excellent at mentoring those you care about whether that be at home or work. Your greatest personal weakness is your fear of being worthless, without value except for your achievements. When your fear of being worthless can no longer be ignored, your world will feel like it is falling apart. If you are a Type 3 and want to reclaim your balance, you need to look toward the positive qualities of a Type 6 personality. As you get more in touch with your better self, you will take on the healthy qualities of Type 3. These include optimism, confidence, industriousness, efficient, a self-starter and practical. Signs you are getting more balanced, include, taking time to slow down, as well as revealing your authentic self in all you do. You are balanced when you allow yourself to show your vulnerable side and take down the protective walls around you. As a Type 4, you are inclined to bring beauty and heart to the world, to be real and have no shame in letting others know about your difficult times. Your greatest personal weakness is your fear of having no identity. When this surfaces, you can become moody, sad and depressed. If you are a Type 4 and want to reclaim your balance, you need to recover the positive character traits of the Type 2. As you get more in touch with yourself, you will take on the higher character traits of Type 4, including creativity, sensitivity, understanding, intuition, supportive, and unique. One sign you are getting healthier is that you no longer get stuck in your emotions. You feel good about yourself. You know you have something valuable to offer the world. You can share your sense of beauty with others. As a Type 5, you are inclined to become very knowledgeable on a particular topic. You enjoy your own company and you have a hunger to learn. Your greatest personal weakness is your fear having no personal significance. When this happens, you isolate yourself from others and go into your inner world. It is a lonely place. If you are a Type 5 and want to find your balance you need to reclaim the positive personality traits of the Type 8. As you get more in touch with yourself, you will take on the positive personality traits of the Type 5. They include being analytical, persevering, sensitive, wise, objective, perceptive, and self-contained. Signs that you are getting healthier include sharing your thoughts on a project or topic with others long before you have come to any final decision or feel you know enough. You take time to care for your physical needs such as exercise and eating good food. You feel relaxed and self-confident. As a Type 6, you are inclined to have many friends. You love to fix problems before they become an issue and you like it when people work together in harmony. Your greatest personal weakness is your fear of having no support or guidance. When this happens, a Type 6 experiences a lot of anxiety often worrying about things that are not likely going to happen. It is a fearful place. If you are a Type 6 and want to find the balance you need to reclaim the positive side of a Type 9. As you get more in touch with yourself, you take on the positive traits of the Type 6, including loyalty, likability, caring, warmth, compassionate, wittiness, practicality, helpfulness, and responsibility. Signs that you are getting healthier include a quiet mind, feeling relaxed, self-confident, self-assured and feeling connected to your inner wisdom. You can enjoy every moment of your day without fearing what may happen. As a Type 7, you are inclined to have fun, seek adventure, and new experiences. You are often the social convener for your friends and you want to live life to its fullest. Your greatest personal weakness is your fear of being deprived and trapped in pain. When this happens, a Type 7 feels pressured to do even more dangerous things to keep the adrenaline going — protecting you from your pain. If you are a Type 7 and want to find balance in your life, you need to reclaim the good personality traits of a Type 5. As you get more in touch with yourself, you take on the positive attributes of a Type 7, including curiosity, playfulness, full of adventure, can see the big picture, grounded, and energetic. Signs that you are getting healthier include a willingness to make sure tasks that were begun are completed as well as finding the ability to slow down and face your pain. You are better able to follow through on what you have promised. As a Type 8, you are inclined to make things happen in your community and world. You have this inner knowledge that helps you to know what needs doing. You are a great leader and force for change. Your greatest personal weakness is your fear of being harmed or controlled by others. When this happens, you're like a bull in a china shop. If you are a Type 8 and you want to find balance in your life, you need to claim the good traits of a Type 2. As you get in touch with yourself, you take on the positive qualities of a Type 8, including directness, self-confidence, energetic, protective, loyalty, and authoritative. Signs that you are getting healthier include allowing yourself to be more vulnerable, expressing emotions, and letting someone into your life at a deep level. People will no longer be intimidated by you. As a Type 9, you are inclined to help people resolve the conflict. You have the challenging gift of being able to understand the perspectives of other people, which can make it difficult for you to make decisions. Your greatest personal weakness is your fear of loss and separation. When this happens, you want to keep the peace no matter the cost to you. If you are a Type 9 and want to find balance in your life, you need to claim the positive side of a Type 3. As you get in touch with yourself, you take on the best qualities of a Type 9, including peaceful, generous, patient, open-minded, receptive, pleasant, and empathic. Signs that you are getting healthier include your ability to express your own needs. You can speak your truth as you understand it. Experiences of conflict are no longer overwhelming. People notice that you no longer have angry, emotional meltdowns. Instead, they get to meet the real you. All of this is about learning to observe your personality in action without judgment. Your Enneagram type is a key to discovering what you need for a balanced life. It is about learning new behaviors that will replace the old habits that no longer serve you. Finding your freedom takes time. There is no quick fix. But, with the help of the Enneagram, you can transform your life. You may find the most significant challenge is to do this without judgment. You have taken years to build these old unhelpful habits and it will take time to create new healthier habits in your life. Using the Enneagram is a tool to help you become present in your day to day life. It is about opening up your 3 energy centers instinctual (belly), feeling (heart), and thinking (head). When your 3 centers are open, you will know what you need to be about in life. In the end, the most important thing is to find your awesome, amazing true self — the person the universe desires you to be.